Pottery finds in archaeological excavations are extremely common across Israel. In fact, pottery sherds usually make up the majority of finds on a site. This is due to the fact that pottery was used as an every day item during ancient times, and because of its make up (non-organic) it remains intact over time (http://apd.farli.org/home/introduction). Since pottery sherds can tell an archaeologist so much about a site and human history, it is extremely important that the finds are dealt with and treated properly. However, since so much pottery is found and it cannot all be kept, it must be dealt with systematically. 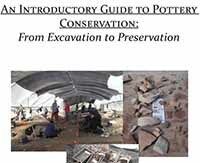 This introductory guide is aimed towards students and will provide the basic concepts concerning pottery conservation, from site excavation to storeroom preservation.